As you taper training in the week before the event, stored glucose in the muscles and liver (glycogen) usage is less, which results in a net-gain in stored glycogen in your body. Carb-loading can significantly improve endurance for long events by maximizing your glycogen stores through increasing your carb intake in the 1-3 days prior to the event. The 4 litres of sports drink in important for the loading regimen and pre-hydration before the event. Use a good quality sports drink that you are familiar with from training. Breakfast needs to be well-thought out because your race start time dictates when you should eat; this is particularly crucial for the two-day teams in the Coast to Coast. You may not want to eat breakfast the same time as your kayaker, because he/she starts at 7:00am, and you won’t start until almost 2 hours later, so it’s OK to delay breakfast accordingly. Due to race logistics, you need to drop your kayaker at the start early before heading for Aikens Corner. Choose foods that can be eaten easily perhaps on the go while driving to Aikens. Examples include bananas, energy bars, Em’s Power Cookies, tinned fruit, sandwiches, and meal replacement drinks. 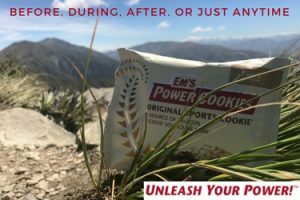 All food (and litter) must be carried in and out with you, so it’s advisable to take compact, high energy foods, such as sports gels, energy bars, Em’s Power Cookies, and gummies. For fluid you can drink water from the river, so no need to carry a hydration bladder. I recommend using an empty drink bottle with a lid if you wish to carry a small amount of water with you. Or, you can use a cup or your hands to scoop up water. Drink from every crossing except the Otira and the Bealey rivers. The advantage of having the bottle (rather than a cup) is that you can fill the bottle as you cross the river, pop on the lid, and carry the bottle in your hand while you keep running and eating. When you are finished, empty the bottle, and return it to its pocket. 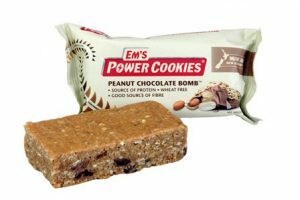 If your run time is slower then add 1-2 more gels and another Em’s Power Cookie. For 2-day competitors ensure that both team members, and individuals get in a high carb and protein recovery snack, plus a bottle of fluid to replace sweat losses within 30-45 minutes of finishing. Follow it up with ongoing snacks and drinks (non-alcoholic) and a generous main meal, like the example in the above carb-loading meal plan. For the start of day 2 and the 15k cycle, the same breakfast timing as above applies. All 2-day teams and individuals should have a bottle of sports drink on your bike to help pre-load for the river. It is advised to use a drinking system (bladder tied in the boat with tubes running to your PFD) with sports drink as your main source of fuel. For a 4-5 hour paddle, you should have at least 3L of sports drink plus 1L Coke, so 2 bladders. In addition to this, take an energy bar or Em’s Power Cookies. For those taking longer than 5 hours, add 3-4 more gels and at least 1 more energy bar. Eating in the boat takes practice, and be sure to have your drinking system operating. At this point in the race, particularly for individuals, the final cycle is a matter of energy management. Plan to take 1 bottle of sports drink and 1 bottle of Coke as well as 2-3 gels and some gummies. Carry an energy bar for back up. Take a few sips of fluid every 15-20 minutes and a gel every 30 minutes. 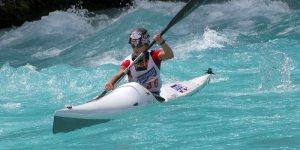 What’s the current advice on drinking water direct from Waimak on the kayak section. Are many people using systems to do this or is it best not to?